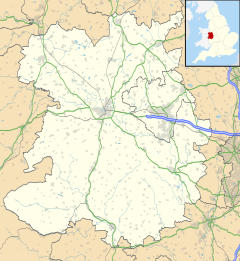 Muxton is an ancient village between Lilleshall and Donnington in Shropshire, England. It now forms part of the new town of Telford, though it is on the town's very northern outskirts. Population was 6,557 as of the 2011 Census, which is a 12.6% increase at the census previous to this one, which took place in 2001. The Shropshire Golf Centre is near Muxton, situated within the Granville Country Park, which itself lies on the southern edge of the greater Muxton area. The village is home to a doctors' surgery, Price-point retailer, primary school, parks, St Johns Church which is a Church of England church, is located in Muxton and together with St. Michael's and all Angels in Lilleshall forms the centre of the Christian community in both parishes. There is a McDonald's located between Muxton and neighbouring Donnington. Muxton also has a post office and various other shops and stores together with a nearby filling station, a Premier Inn and a Restaurant. Wikimedia Commons has media related to Muxton. This page was last edited on 21 April 2019, at 13:35 (UTC).